Though the technology is nearly as old as pneumatic tires themselves, bias-ply tires still present a viable option for many machines. They are manufactured by lapping multiple plies of rubber diagonally over each other—also called “on the bias”—to create a single working unit. Because of the way bias tires are engineered, the tire’s sidewall and tread are connected and work together rather than independently. The advantage of bias construction is that it creates a stiff, strong, durable tire with rugged sidewalls, making it a great choice for machines threatened by stumps and rocks, or equipment that requires a lot of stability—for instance, tractors that often drive across hillsides. Bias-ply tires are also typically less expensive than radials. Negatively, the stiffness of a bias tire also means that bumps in the field are transferred throughout the entire machine, diminishing a tractor’s ride quality. And because of the way the diagonal plies transfer movement across the tire carcass, when a bias tire’s sidewall flexes, so does its tread, reducing traction and potentially increasing damage to your field. Over the years, radial tires continue to claim more and more of the farm tire market. As machinery has gotten larger and more powerful, radial tires have been better able to meet the demands made of them by today’s heavier equipment. Unlike bias tires, radial tires are constructed in two parts that are designed to work independently of one another—the body plies run perpendicular to the bead, and the undertread area is wrapped around the tire’s circumference by radial belts of fabric or steel. The belts create a broader, flatter footprint and provide increased resistance to tread punctures. One of the distinct advantages offered by a radial tire’s two-part design is that flex in the sidewall isn’t transferred to the tread, allowing for better traction, increased fuel efficiency, and reduced soil compaction and field damage (radials can have a 15-25% larger footprint than a bias tire). All of these qualities ultimately add up to more productivity and efficiency around the farm. Radial tires will also last longer and provide a smoother ride than bias tires. Similar to the way radial tires came to be accepted by overcoming the limitations of their bias-ply forbears, today’s IF/VF tires are being produced to meet the new challenges facing today’s farmers: namely, larger and more powerful machinery and an improved understanding of the negative effect soil compaction has on yield. Simply put, IF/VF tires are a radial with a sidewall engineered to allow for more flex (click here to learn more about IF/VF tire construction). Because of this, IF/VF tires can carry a higher load than conventional radio tires. Furthermore, they can be used at a lower tire pressure, allowing the tire to create a larger footprint which improves traction, reduces slippage, and lessens soil compaction. Of course, for radials and IF/VF tires to outperform their bias counterparts, it's critical that they be operated at the correct tire pressure—so if you’re going to invest in a good set of radial or IF/VF tractor tires, pick up a good tire gauge at the same time. Whether you’re looking at a bias, radial, or IF/VF tire for your next farm tire, Alliance Tire has a bunch of great choices for your machine. The Alliance FarmPro 324 is an excellent option for farmers looking for an affordable do-everything bias-ply tire. Purpose built to handle the numerous jobs tractors are tasked with around the farm, the 324 is a reliable, durable, and affordable option that’s ideally suited for general use tractors. As for radials, we’ve got a wide range of designs, from classic tractor lugs to our venerable Alliance 550 MultiUse, which is designed to handle whatever job you throw at it. In the field, the Alliance 550 provides great traction, low compaction, and excellent stability while also being capable of achieving high speeds on the road. 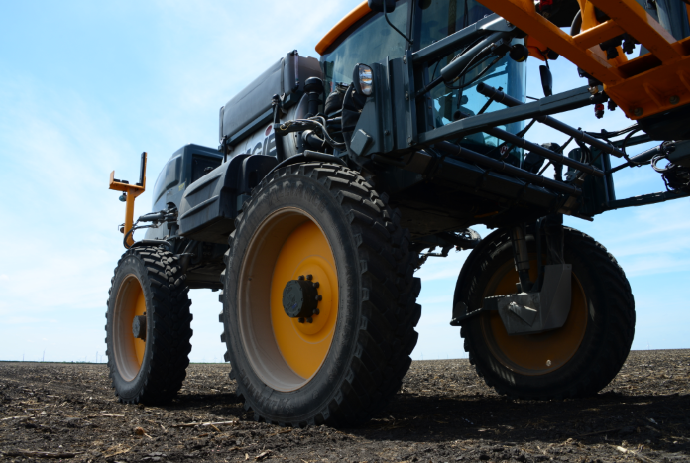 The Alliance 354 IF/VF is one of our most advanced tractor tires, with the ability to carry between 20% (IF) and 40% (VF) more load than a conventional radial as well as the ability to run using 20% (IF) and 40% (VF) less pressure than conventional radials. Still wondering if a bias or radial tire is right for your equipment’s needs or want to learn more about Alliance Tire’s other great farm tires? Contact your Alliance Tire dealer today to find the right tire for your machine.